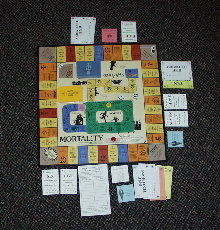 Mortality is an LDS game that incorporates LDS teachings into roll and move mechanics. Which is a shame, as there are some quite decent LDS games out there, but this doesn’t appear to be one of them. You just roll and move, occasionally using “wisdom” cards you’ve acquired to move if you have them. You win by gaining the most “testimonies”, but it’s hard to see how that’s much different than gaining the most money and/or points. And what’s up with the winner “finishing mortality”? Uh, does that mean dying?